ANS Performance Ketosys is a dietary supplement that contains ketone sources. The idea behind taking these nutrients is that they will cause your body to become ketogenic. It can be used to supplement a ketogenic diet or to start one. 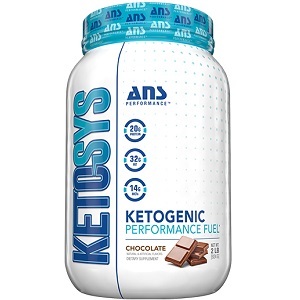 The manufacturer claims that ANS Performance Ketosys will improve mental and physical performance especially during a workout. The ingredients in the supplement of all sources of fatty acids, especially medium chain triglycerides. These triglycerides are broken down by the body to be used as an energy source and in the process they produce ketones. Ketones can be used by the brain and by the muscles as an efficient source of energy. Some manufacturers include already formed ketones as part of their supplement, which this manufacturer does not. Including already formed ketones helps to speed up the breakdown of the sources of ketones in the body so this would have been a helpful ingredient. The supplement does contain lipase though which is an enzyme that helps to break down fat – like the fat in these ingredients. The acesulfame is used as a non-nutritive sweetener. One serving of this supplement can be taken a day. A serving consists of mixing one scoop of the powder with water, but the manufacturer does not specify how much. We recommend 8 oz. Each serving contains 14 g of medium chain triglycerides (the main source of ketones in a ketogenic diet). People who are allergic to coconut should avoid this supplement. There may be some side effects from acesulfame, as well, which includes headaches and nausea. Pregnant and nursing mothers as well as people who suffer from chronic medical conditions should consult a doctor before using this supplement. The supplement can be purchased online for $44.99. This price does not include shipping, but there is free shipping on all orders that are over $99.99. This could be considered a small discount on bulk orders, but there are no other discounts apart from this one. This product is guaranteed for 30 days after purchase. It covers both used and unused products, for any reason that the customer may feel unsatisfied for. The manufacturer advises that the customers keep as much of the original packaging and paperwork while testing the supplement, as these must be sent back to them as part of the return. ANS Performance has the right idea, but their supplement is just lacking in a few things. Their sources of ketogenic ingredients are well considered and can most certainly be used to generate ketones by the body – but this will take several days without the addition of preformed ketones, especially if the user is not following a high fat diet. This supplement is cheaper than many of its competitors, although we can attribute this to the fact that it does not contain any ready-made ketones. We also believe it is right of this manufacturer to offer a guarantee, but 30 days is not long enough for a customer to test the product properly. John Parker	reviewed ANS Performance Ketosys	on November 14th	 and gave it a rating of 3.